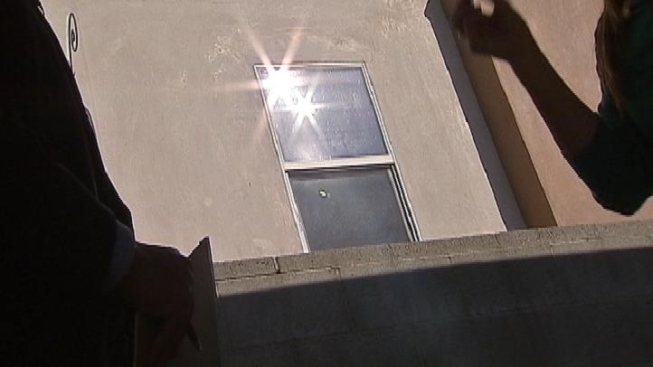 Double-pane windows are known for being energy efficient, but experts say they can reflect light and damage cars parked near them. What was to blame for the damage to Heather Petrone’s new Prius, and to other cars in her carport? "I started noticing my side-view mirrors looking warped," Petrone said. "It kind of looked like somebody had taken a blowtorch on my mirrors." Turns out it the culprit may be the sun's rays, bouncing off a double-pane window next door to Petrone's condo in Studio City. Two winters ago, the side view mirrors on three cars in that carport, including Petrone's new Prius, basically melted. She thought it was a faulty defroster unit, but Toyota said no. "One guy happened to mention that he's read articles across the country of Low E (low emissivity) glass doing harm to other people's properties," said Petrone. According to experts, the double pane window can become concave, causing it to act like a magnifying glass. "It is literally creating a laser-type focused beam," said energy auditor Jerry Berberian. "It hit over 300 degrees at 10 in the morning." The damage seems to be happening primarily in the winter months. "In the summertime this will never happen, because it's going to be hot and the sun is higher in the sky," said Dan Thomsen, of the building doctors.com. "So the beam that it's creating is just coming across, moving across the vehicles." But the irony of the whole thing is not lost on Heather. "I think it's really funny that I have an energy efficient car," says Petrone, "and an energy efficient window is ruining it." The building doctor said this can easily be remedied by either completely replacing the glass or going with the cheaper option of putting a film on the window to dilute the sun's reflection. Neither of which has happened yet, so Heather continues to park in her garage.